Purchase this sidewall vent cover to hide unattractive ductwork while also displaying a beautiful Arts and Crafts design for all to see. This solid bronze air vent is made in a sand cast and is durable enough to use in your floor, wall, or ceiling. When installing the sidewall vent cover, you are provided screws and pre-drilled screws holes in which to mount the unit onto the wall. Select the no screw holes option if it is being used in the floor. 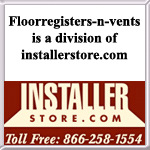 Please also specify in the customer notes section if the vent is for floor use. Made in America, our bronze air vents have a 1/4" thick solid bronze faceplate to give it an old fashioned feel. Our sidewall vent covers can be purchased with or without a black screen backing, which is meant to further cover up your ductwork from being seen. Once purchased, the bronze air vents are made just for you! The bronze sidewall vent cover is offered in one of three hand rubbed patina finishes which are shown below. You can choose from a light bronze, dark bronze, or antique burnished bronze finish to compliment your decor. Please note that overtime the solid bronze air vent finish may age and change color due to natural causes. Tip: These sidewall vent covers need to be ordered according to your actual hole opening and not by the measurement of an old vent. The Arts and Crafts bronze air vents are listed in inches and the 30 x 8 grille will fit over a hole of that size. The outside sidewall vent cover faceplate is approximately 2 inches larger than listed size. Because vents are hand crafted, measurements may slightly vary from time to time. Important: These bronze air vents are considered non returnable, special ordered items and cannot be canceled once a purchase has been made. They are made to order and may take between 7 to 9 weeks for item to ship out. 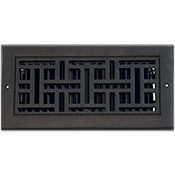 Find more sidewall vent covers crafted by Classic Grilles which range from modern to very eccentric designs. Also, this bronze air vent is offered with a damper unit to control airflow. Our solid bronze sidewall vent cover is a necessary investment when refreshing your homes design and functionality. Order now.